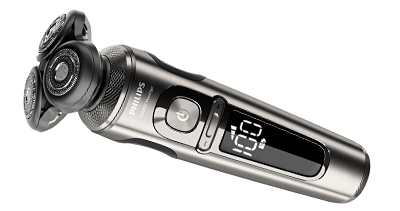 New Arrival: Philips Shaver S9000 Prestige « Tech bytes for tea? From the brand that premiered the world’s first rotary-type electric shaver 80 years ago, Philips continues to break boundaries with the world’s closest electric shave with uncompromised skin comfort. New NanoTech precision blades are strengthened with nano particles and extra strong, sharp edges to cut hair with the highest precision, delivering extremely close results at skin level. The multi-direction ContourDetect heads, with Philips’ proprietary rotary technology, capture hair growing in different direction and densities, delivering the ultimate close shave even in tricky areas along the neck and jawline. Experience better well-being for the skin, with Superb SkinComfort rings that come with an anti-friction metallic-pigmented coating for smooth gliding. The shaving head also comes with new wider, rounder openings to catch more hair in a single pass. Thanks to Philips’ BeardAdapt Sensor which checks hair density 15 times per second and automatically adapt shaving power to your hair, you are ensured of a highly efficient shave even on a longer (up to 7-day) beard. Highly customizable, opt for a comfortable dry or wet shave with Aquatec Wet & Dry technology, or switch between 3 modes for anything between a gentle and thorough shave, an everyday shave, to a quick shave. The Philips Shaver S9000 Prestige has luxurious features, including wireless charging of the shaver or any Qi-compliant device on a Qi charging pad, to up your technology quotient. It also comes in a premium packaging that stores your grooming essentials. This entry was posted on Thursday, March 28th, 2019 at 7:00 am and is filed under Accessories, Appliances, Beauty, Figures, Gadgets, gadgets, Launch, Lifestyle, Philips, Press Release, Prices, Shavers. You can follow any responses to this entry through the RSS 2.0 feed. You can leave a response, or trackback from your own site.